Whilst we have a variety of different genre’s to thank for the initial emergence of Grime, it is perhaps Dancehall which has retained the most recognisable contributions to today’s scene (from a live performance aspect, at least). The very notion of a pull-up (or a ‘restart’ if you’re asking a journalist from the Evening Standard) is derived directly from Dancehall’s sound clash culture, and has grown to be an integral part of any live Grime set. The UK originated genre still has some catching up to do, though: the very first Dancehall sound clash being recorded in 1952. Since then, it’s been up to events like Sting (a festival worthy of its own article) to keep the movement alive in the Caribbean – which they have done to great effect – even beyond Sting’s closure in 2015. Red Bull have attempted to replicate this on numerous occasions with their Culture Clash series – consistently incorporating both Dancehall and Grime into their events. Over in the UK, however, the founding fathers of Grime started their own movement which has expanded beyond even their ken. 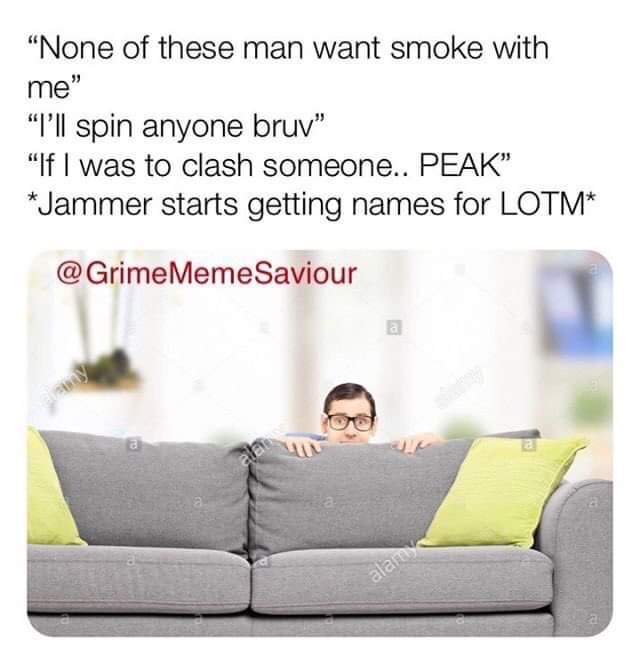 If you gave me the option of just two words to use as a litmus test for someone’s knowledge on Grime, I’d struggle to find two more succinct, esoteric words than “Jammer’s basement”. This, of course, being both the home and origin of the famed Lord Of The Mics clash series – organised and operated by Jammer himself. 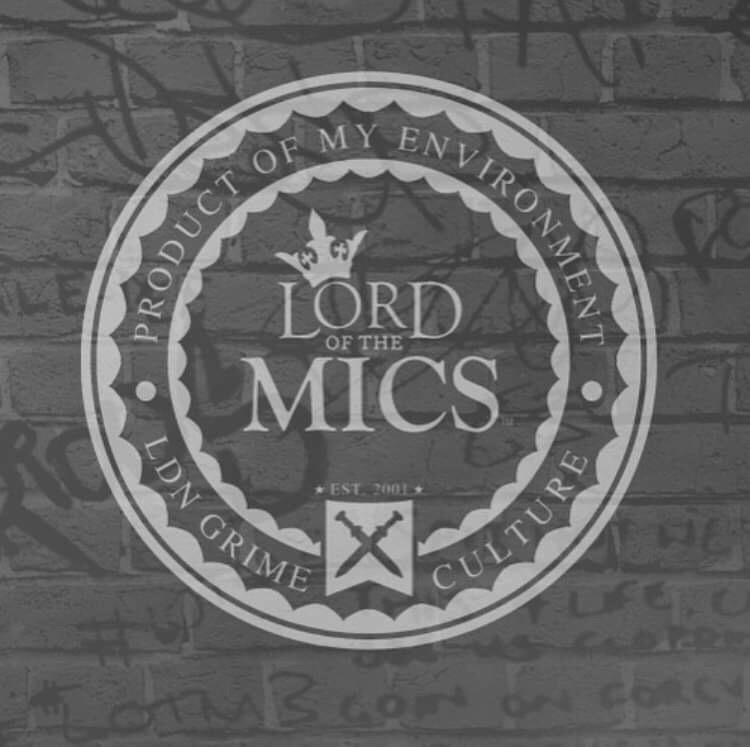 Since Lord Of The Mics 1 first came out on DVD in 2004, a lot has changed; not least the medium of distribution. One thing which has remained the same, and will always be prevalent in the Grime scene, is the competitive nature of MC’s and their innate hunger to put that self-confidence to the test. A lot of Grime’s most legendary moments have been born out of battles. 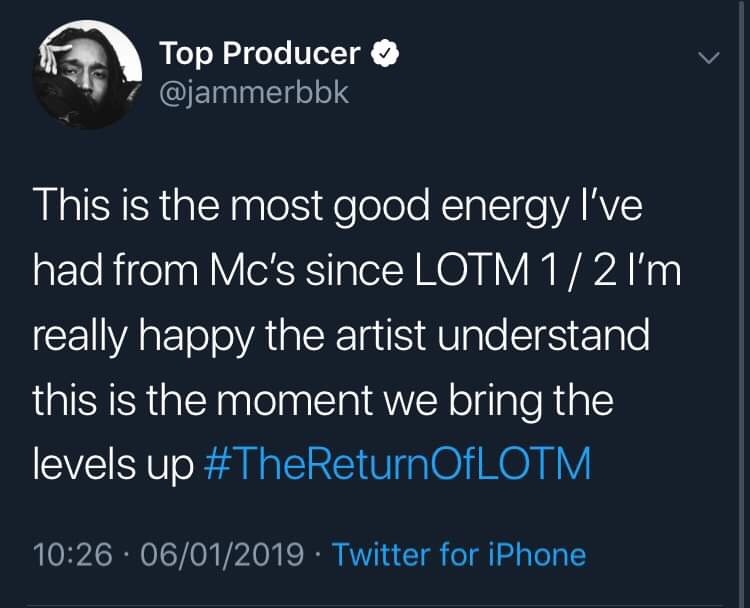 Whether it’s the much debated Wiley vs. Kano on LOTM1, the infamous Skepta vs. Devilman on LOTM2, the more recent fiasco that was P Money vs. Big H on LOTM6, or even the spontaneous Ghetto vs Bashy clash and the famed ‘Ask Carlos’ moment which followed – there is no escaping the world of clashing within this ego-driven universe of MCing. 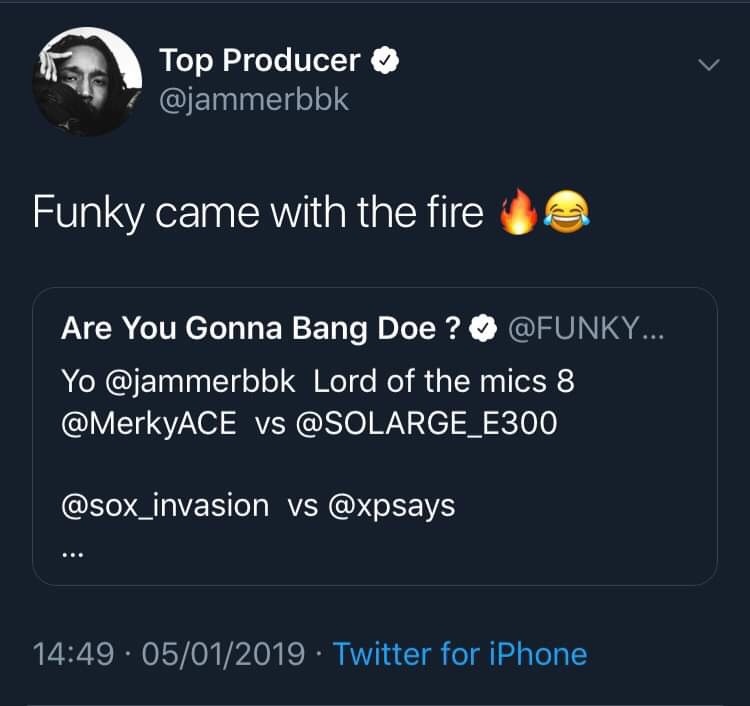 A seemingly random tweet from Funky Dee has sparked a week long melee of online back-and-forths, clash suggestions, and even diss tracks, as news of a LOTM return hit the Twitter streets. An eternal instigator and perpetual pot-stirrer, Funky Dee managed to gas Jammer up to the point of immediately arranging match ups, searching for both male and female MC’s from all across the UK. Thank you Funks, we needed this. The new generation of Grime MC’s have revived the radio circuit in recent years and it’s only natural to channel that energy into the battle arena – following on from the great work set in motion by DJ Argue and Ten Dixon with their Royal Rumble-esque Hell In The Cell event in 2018. The event featured a room full of hungry, energised MC’s, all out for blood. It was organic, authentic, but most of all it was entertaining. Before that, the most recent example we had of a battle event in Grime was the controversial Red Bull Grime-A-Side. While it had the entertainment aspect (talented MC’s, perfect visual/audio quality) it definitely lacked the authenticity of a genuine Grime clash. It was too formatted, too censored and ultimately too corporate; kudos to Red Bull for giving it a platform nonetheless (although definitely sort out the voting system if you do it again). So here we are, at the very beginning 2019, glued to the timeline in anticipation of who’s going to diss who next. Did I expect this a couple of weeks ago? Probably not. Am I here for it now it’s arrived? You bet. You’d never have guessed it, but Ten Dixon was at the forefront of almost every war of words this week. I know, I know – I was as surprised as you. 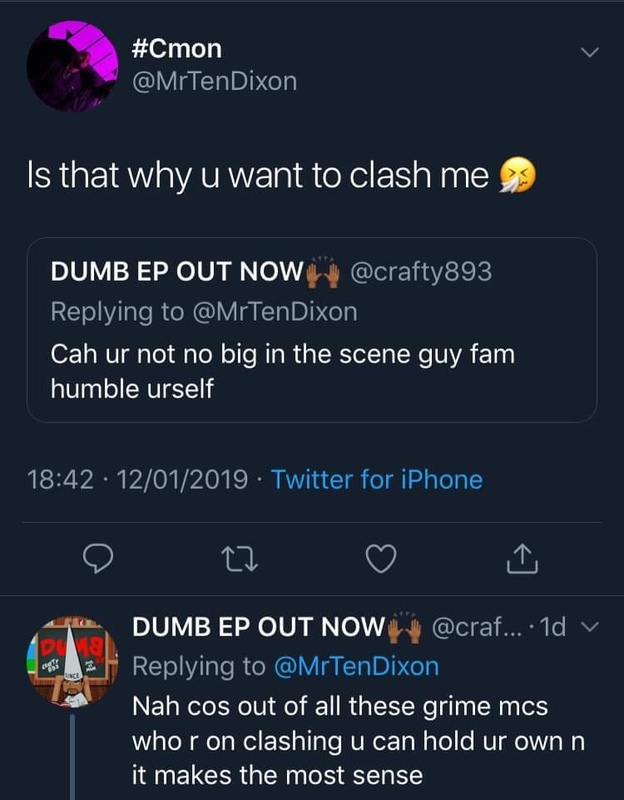 The ever eager W.A.V.E Gang mic man has let his feelings be known over the past few days, moving on from his long running feud with Nottingham’s Shxdow and turning his attention to potential LOTM opponents, fellow South Londoner Crafty included. Another previous sparring partner of Ten’s, 17-year-old Stevenage sheller SBK, has also been very active on the frontline this week. 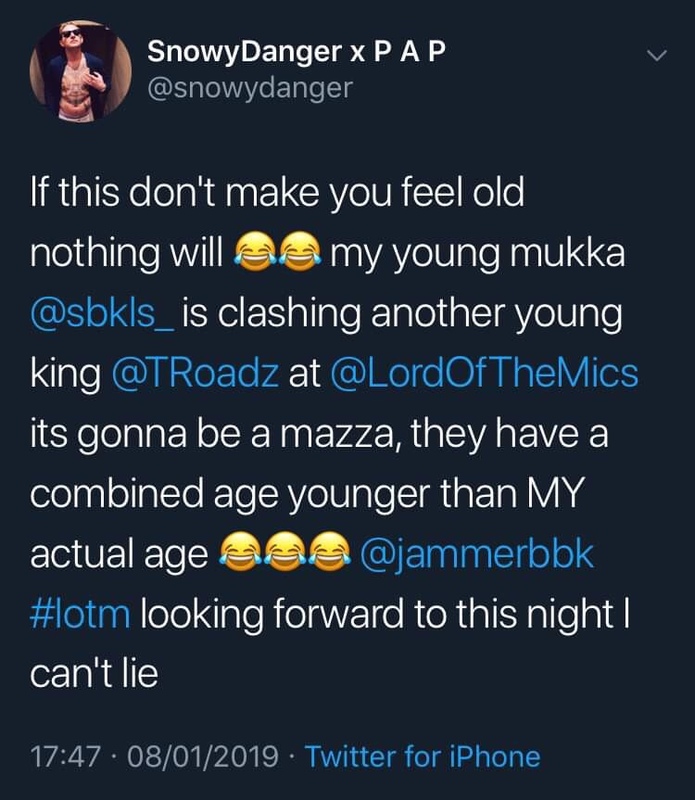 After fans pitted them against each other, SBK and 14-year-old Birmingham prodigy T.Roadzexchanged a few light jabs online before actually taking the feud to wax – SBK letting off the first round in style (via Grime Report TV) and T.Roadz responded the following day with a video of his own, which he recorded in SBK’s hometown of Stevenage. At the time of writing, SBK has just unleashed visuals for his track directed at T.Roadz, once again via Grime Report TV (large up Lordie). Whether or not it can be put down to youthful exuberance, this is Grime, and it’s this kind of ‘actions over words’ attitude which some of the older MC’s could take note of. Also in the thick of it was South Londoner Yizzy, a Grime-A-Side graduate, who continues to face a significant backlash over his theft of bars a few years back. The plagiarism video resurfaced (in which Yizzy mimics various flows and bars from mostly Midlands MC’s) leaving him with some explaining to do once Jammer bore witness. Another consistent warlord is the talented MicOfCourse, who has actually been relatively calm in the eye of this current storm, but will undoubtedly make his way onto the line-up. 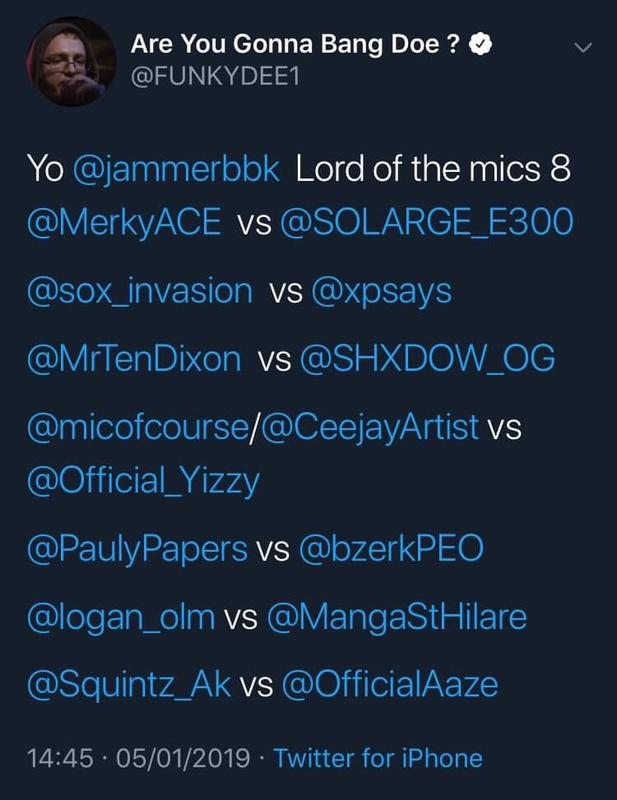 Mic vs. Yizzy, anyone? Major Muzik’s own Tommy B has expressed his desire to step into the ring, and there’s been much speculation over his opponent, with the likes of Tana (from Birmingham’s Invasion Alert) and also Bristol MC Jay 0117 (who previously clashed Tommy at the aforementioned Hell In The Cell event). The ladies cannot be neglected his year, either. 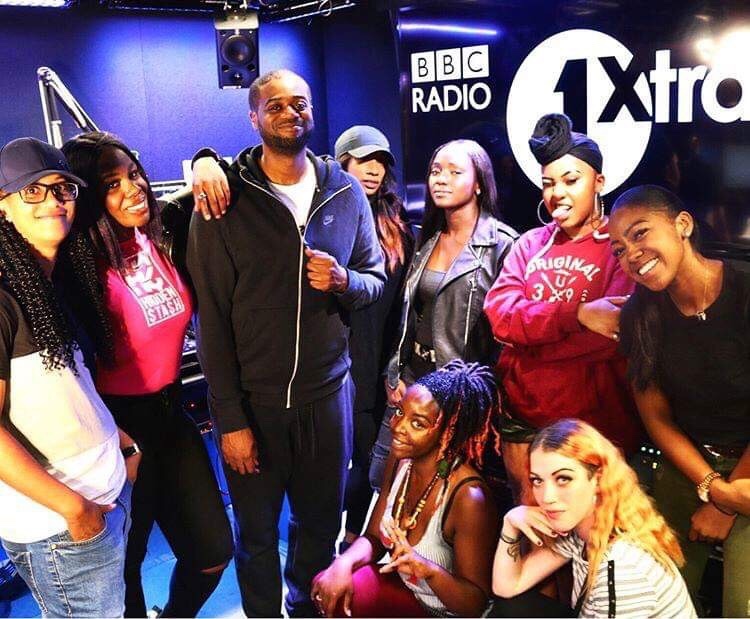 After Lady Leshurr’s continued success and Stefflon Don’s explosion into the mainstream, it was only right that this next Lord Of The Mics had some gender diversity. Having mentioned Grime’s radio resurgence, it’s only right I mention the Radio King of 2018. As one half of the duo known as The Other Side, Logan has been tearing up radio sets and is now taking his powers to the big stage. Definitely going to be one to watch. Essex’s Gen has also entered 2019 making an abundance of noise, and has subsequently had his name thrown in the hat for possible entrants. An impressive writer and impeccable performer, I’m definitely looking forward to a salvo from the General, regardless of the opponent. Other names being considered are the likes of Rawza from Wellingborough, an exciting prospect whenever on set, and talented London MC Ghstly XXVII. Although these two have been less active on the timeline, both of them have serious pedigree when it comes to war on wax. One week and several hundred tweets later, we have our first draft of the official line-up. Meetings were held, arguments were made, and ultimately these were the choices decided by Jammer and his impromptu coordinators in the meeting room: D Double E and Sharky Major. Even though it’s just the preliminary stages of the line-up, Twitter has already found time to be excited, delighted, and disappointed, all simultaneously.. These are Grime fans after all. Once the official final line-up has been announced, please check back to threethousand for in-depth analysis, previews, and predictions of each MC/each clash. It’s war season people, brace yourselves.